The Jewish calendar is set up so that the Sedra of Miketz is always read on Chanuka, when the nights start to get longer and the days shorter. This turning point in the year is accompanied by the Chanuka lights, which symbolically represent the triumph of light over darkness. This is the motif of Joseph: “He sets limits to darkness”. The connection here between the festival and the cycle of nature makes us aware of the profound harmony between the laws governing the destiny of the Jewish people and those establishing the Divine order of creation. The Greek empire which sought to assimilate the Jews at the time of Chanuka is compared to darkness. This is another connection with our Sedra! Moreover, if we examine the history of the Greeks, we see that they were famous for their culture. They wanted to flood us with their theatres, their architecture and their Olympics. But look closely - how do we watch a play in the theatre? We sit in the dark. It’s the same with the cinema or the disco; they’re all based on being in a dark atmosphere. But the Greeks (or their modern equivalent) will never have power over Jacob, who is compared to fire. And what do we associate fire over darkness with? No prizes for guessing - Chanuka! Besides being compared to darkness, Greece is compared to the rabbit. Why? Because the rabbit has a symbol of kashrut in its throat. This shows us that the Greek culture was merely external. One can have the ‘gift of the gab’, but it takes more than that to make a true lasting impression. The people of Israel, on the other hand, are based on internal values. Rav Yoel Schwartz of Dvar Yerushalayim points out an interesting comparison. He says that whereas the Jews are called “The People of the Book”, the rest of the world is “The People of the Newspaper”. What do we do after we finish reading a newspaper? We throw it away. A paper is good only for one day. A book, on the other hand, is kept on a shelf and re-read. This is the difference between the Jews and the rest of the world. Our message is everlasting, not just for the present. Having gone off on one of my tangents, I would like to return to the Sedra, back to Pharaoh’s little problem. Having had his strange dream, he is in the grip of terror. The chief butler, fearing that Pharaoh would die, thought to himself “I don’t know if the new king will keep me in my position”. Therefore, he mentioned Joseph to Pharaoh. The butler also had a fear that Joseph might rise to power and dismiss him of his job for having forgotten Joseph in prison for two years. Therefore, when he mentions Joseph, he doesn’t do it in the most complimentary way, calling him a Jew boy slave. I always remember this part of the Sedra when I have to deal with the rat race. Have you ever had a business colleague whom you honestly did a favour for, and who subsequently stabbed you in the back just to find favour with the boss? [I’m presuming that the fellow wasn’t Jewish!] This is what I call the Butler Complex. Whatever you do to these guys, they will always want ‘one over’ you. Nothing stops them from their goal at the top. If you ever meet one of these guys, read them this part of the Sedra. So Joseph is hurriedly rushed out of prison and presented to Pharaoh to interpret his dream. This was the also the case with the exodus from Egypt, which was made in great haste. [Last week you may remember the connection between Joseph and the splitting of the Red Sea] This will also be the case with Mashiach; every providential act which leads to someone being rescued miraculously from the depths of the abyss comes by surprise, at the moment when one least expects it. And what more of an abyss than the present exile! The question is, are we ready for that surprise? Joseph gives his interpretation to Pharaoh’s dream, and gets it right. In fact, as soon as Pharaoh looked at Joseph, he immediately understood that the young Hebrew was not only a noble and free man, but also a sage, perfectly capable of interpreting his dreams. Pharaoh even changes some of the details, but Joseph gives the interpretation as to what Pharaoh actually dreamt. But Joseph is quick to comment that the interpretation is from G-d, thereby causing a sanctification of G-d’s name. It is also important to note that the Pharaoh’s dream occurred on Rosh Hashanah. Dreams on this night have a particular significance, since the future destiny of a country (including periods of fertility and drought) are decided at this time. On the other hand, these dreams were meant for the king who presided over the destiny of his people. The higher the position occupied by a person, the more important is any revelation which he receives (just read the Kuzari). Joseph understood that Pharaoh’s dreams were of importance not just to himself and his family, but to the whole nation. Addressed to the king of the strongest world power of that era, and on the night of Rosh Hashanah, they could only have been the revelation to Pharaoh of what G-d was planning to do. Joseph then gives Pharaoh some advice of his own, without being asked. He must have looked upon the sudden way he was brought before Pharaoh as a providential event. His advice was a veritable lesson in management. According to Rashbam, he advised separating a fifth of the annual produce during the seven years of plenty for distribution in the seven years of famine. Free trade would temporarily be abolished (Egypt being the principal exporter of grain) and the state would purchase everything. Joseph’s plans put all the resources of the country at Pharaoh’s disposal. It’s not surprising that he was taken on as top dog! 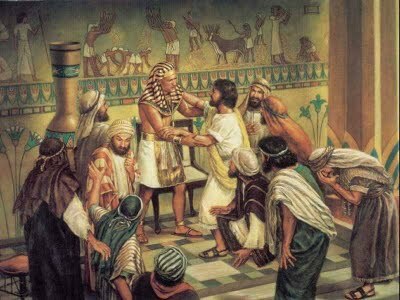 At first, the servants of Pharaoh objected to Joseph’s position, claiming that Joseph was a slave, and not worthy of being a ruler. Pharaoh replied: “I see in him signs of royalty - wisdom, strength and noble bearing. He was wrongly sold as a slave.” The servants reminded him that the rule for high dignitaries is that they have to know all seventy languages. Pharaoh decided to test Joseph the next day. That night, the angel Gabriel came to teach Joseph these languages, but he couldn’t learn them. Hashem added the letter ‘hey’ to Joseph’s name, and the next morning, he was able to speak to Pharaoh in all seventy languages. In the end, Joseph addressed Pharaoh in Hebrew, but he didn’t understand it. He asked Joseph never to reveal this weakness to anyone (the king was supposed to know all existing languages). Once again, Pharaoh was in awe of the Jew. 1. Pharaoh feared that Potiphar would meet Joseph in the street and say “You are my former slave.” But once Joseph was his son-in-law, he would praise him to all, telling him how the Midianites had stolen him, and he had never been a slave at all. 2. Potiphar’s agreement at the shidduch with his daughter and Joseph was the best way to silence the wagging tongues who had spread libel about Joseph and Potiphar’s wife. Now all could see that Potiphar himself did not believe the libel, or he would never have let Joseph marry his daughter, lest his wife come into contact with him. 3. Pharaoh wanted to make Joseph as acceptable to the Egyptian public as possible, marrying him off to an Egyptian so he would come to be like a native himself. Meanwhile, seven years pass, and the world became under the grip of a famine. Due to Joseph’s foresight, Egypt becomes the food centre of the world. Jacob sees this, and sends his ten sons (Benjamin stays behind) to purchase provisions. Joseph finds them and asks them “From where do you come?” The brothers answer “From the land of Canaan, to buy food.” The question is raised thus: Joseph only asked them where they had come from, not what for. The brothers didn’t need to give a reason for their mission. One answer to this, is that they were covering up their true intentions, which was to find Joseph. It’s sort of like a kid who steals from a cookie jar and is asked by his mother “What were you doing?” He replies “I was going to the kitchen, er, but I wasn’t going to steal cookies.” Sometimes, we blurt things out when we are trying to cover things up. We were all kids once. But the other explanation that I read in ‘Oznayim Letorah’ is interesting. The brothers were so used to apologising for leaving Israel that they did so now. They explained that they were forced to leave Israel because they had to “buy food.” What does this teach us? That to leave Israel was forbidden except for a valid reason. This should serve as a lesson to all those Israelis who make ‘yerida’ by going to the Far East. Let’s hope they have a good excuse. 3 “Father”, said Isaac, “I am young and fear that my body may shake from fear of the knife [so that I] will cause you distress, disqualify the slaughter and invalidate the sacrifice [therefore] bind me very well to the altar (Bereishis Rabbah 56:8). 4 Rebecca came with Eliezer, and when she saw Isaac wrapped in tzitzit, his appearance [was] like an angel of G-d (Shocher Tov 90:18). 5 Even after his father’s death, Isaac treated his father with respect and did not send her out of his father’s house (Bereishis Rabbasi p.102). 6 Why didn’t Abraham bless Isaac? Because he saw that Esau would issue from him (Pesikta D’Rav Kahana 31). 7 The angel of death had no power over six people [but rather they died by a kiss from the Divine Presence]: Abraham, Isaac, Jacob, Moses, Aaron and Miriam (Bava Basra 17a). 8 G-d spoke with the Patriarchs fifteen times altogether: eight times with Abraham, twice with Isaac and five times with Jacob (Midrash Rabbi Eliezer 6). 9 Isaac institued mincha, the afternoon prayer (Berachot 26b). 10 Pretending to be jesting, Ishmael took a bow and arrow and shot in the direction of Isaac [with the intention of killing him and making it appear as an accident] (Bereishis Rabbah 53:11).